Violating VA regulations, St. Augustine mayoral candidate KRIS PHILLIPS, owner of WFOY AM & FM (Hate Radio), had five (5) photographs taken of her at the Memorial Day observation at the St. Augustine National Cemetery, publishing them on Facebook®. I am prepared to report KRISTENE "KRIS" PHILLIPS to the U.S. Department of Veterans Affairs and sent her a Cease and Desist letter (see below). Kris Phillips for St. Augustine Mayor added 31 new photos — with Kris Phillips. What a beautiful Memorial Day gathering at the National Cemetery. There were tears, hugs, songs and celebration in honor of those who gave their lives for the freedoms we enjoy today. I'm truly proud to be an American, and also to live in a city with such a long military history. A sincere thank you to all who have paid the ultimate price so that the rest of us can continue to live free. And thank you to those who have, and still do serve our country today. Your bravery and sacrifices are unimaginable to most of us. Words cannot describe how truly thankful we are! 2. The South Jersey Chapter of the 82nd Airborne Divn. Assn., Inc. is named the "CPL Edward A. Slavin Chapter" after my late father: my dad was a machine-gunner who taught map-reading, a paratrooper, a wounded, thrice-decorated veteran of three World War II combat jumps (North Africa, Sicily and Normandy). My father is buried in a national cemetery. 3. Our war veterans buried at our St. Augustine National Cemetery include veterans of every single American war since the 1830s, including the Seminole Wars and the Civil War. Some of the honored dead there are former slaves, whose graves are identified on gravestones as "U.S.C.T." (U.S. Colored Troops). 4. 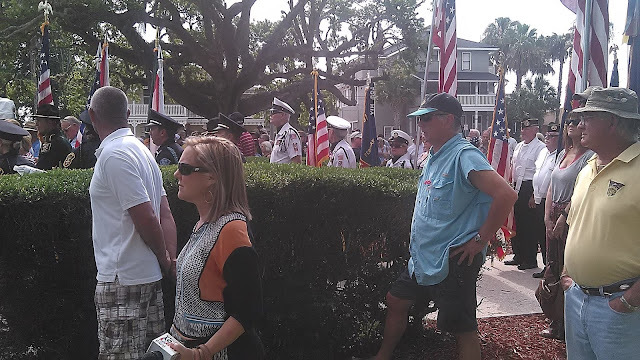 Thus, your Facebook ad -- containing five (5) different photographic images of you wearing sunglasses, posing for photographs, holding your WFOY radio microphone at St. Augustine National Cemetery on Memorial Days 2016 taken from different angles -- dishonors our deceased American veterans' memories and burials. Almost all of your current Facebook page consists of the deeply offensive Memorial Day posed photos: it stinks of using our veterans cemetery for political purposes. Our veterans are not your props, and St. Augustine National cemetery is not your advertising venue. You have violated federal law in your political campaign for St. Augustine Mayor, Ms. Phillips. 5. Political ads filmed in national cemeteries are a stench in the nostrils of our Nation, and illegal. 6. How much did your political campaign spend on filming you and sharing the St. Augustine National Cemetery ad on Facebook? Why? 7. How many Facebook readers received it? Please provide documents and invoices. 8. Who wrote and produced the Facebook ad and why? Please provide documents on script approval and payment. 9. Did St. Augustine National Cemetery management ever give you or those acting in concert with you written permission for filming a political ad? Please provide any documentary evidence for any such assertion. 10. Please provide all documents on the St. Augustine National Cemetery ad and kindly call me to answer questions later today. 13. Former Florida State Rep. Ronald "Doc" Renuart used such an ad filmed at St. Augustine National Cemetery in 2014, ignoring my cease and desist letter. 14. Your posting a Facebook ad filmed in St. Augustine National Cemetery is hurtful, intrusive and deeply insensitive. It shows an utter unwillingness to adhere by reasonable standards of probity of an American candidate. It shows you have learned nothing from the prior partisan political misconduct of Senator McCain, Congressman Cramer and State Rep. Renuart in filming ads at national cemeteries. As the old song says, "When will they ever learn?" 16. Please apologize publicly for your Facebook ad photos staged in our St. Augustine National Cemetery.